Grab this magnetic palette for ONLY $1.50 with Amazon.com PRIME and a code from the gleam at bottom of blog post. DIY Magnetic Makeup Palette: you can collect your favorite eyeshadow,lipstick,blush,powder which in storage in metal iron pans into this large magnetic makeup palette. 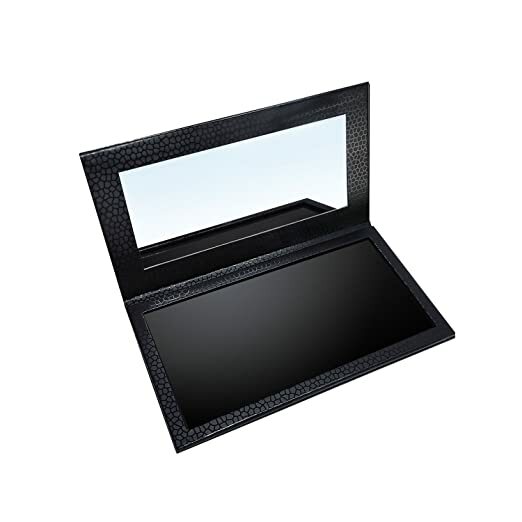 Large Magnetic Makeup Palette:9.84*5.51*0.47 inch,which can storage 18pcs 1.41 inch diameters eyeshadow. High Quality Magnetic Makeup Palette: 100% handmade,using environmental protection cartons and plastic magnets material,protable,anti-broken,anti-pressure and strong magnet. Fashion Magnetic Makeup Palette: professional fashion black case,includes a big makeup mirror and an open magnetic base to fit any size shadow, blush, bronzer, and even some foundations. Popular Magnetic Makeup Palette: portable makeup palette perfect for display and for easy color comparison of makeups,travel,home,daily use;perfect gift for pro's,beauty lovers,makeup artist,wife,girl friends,ladies,women,on her birthday,christmas day,mother's day,valentine's day etc. Are there lots of eyeshadow palette,lipstick,blush,face powder and other cosmetic in your home?Is it hard for you to choose which cosmetics to take with when go out?This portable magnetic makeup palette is your perfect choose.You can storage your favourite eyeshadow,lipstick,blush,face powder in one makeup palette.You can replace the colors in your makeup palette as often as you would like.